Rajinikanth Film Review From Payum Puli. Payum Puli Movie. 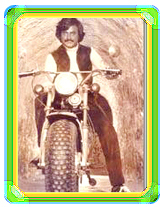 Rajini Film Payum Puli. Rajinikanth Payum Puli movie. www.rajinikanth.com. Paayum Puli saw the return of the successful combination, Rajni - AVM - SP Muthuraman, back for the third time. Ilayaraja scored the music for Vali's lyrics. This was Rajnikanth 79th movie and it went to run more than 100 days. Radha paired with Rajini in this movie.